Few areas in the home are as full of sharp objects, heat sources, slippery floors, and dangerous chemicals as the kitchen. Even kitchens that have childproofing measures installed can be very dangerous, and nannies should take special care to supervise their charges while in the kitchen and reduce the risk of injury to her charges or herself by taking the proper precautions. Keep Surfaces and Utensils Clean – Food-borne illnesses like salmonella and E. coli can be very serious, especially for young children. To prevent transmitting these diseases to your charges or yourself, be sure that you adhere to safe food handling practices and keep all of your surfaces and utensils clean. Uncooked meats and eggs are especially notorious for causing food-borne illness, so handle them with additional care. Enforce Hand Washing Rules – It’s just as important to be sure that everyone washes their hands as it is keep surfaces and utensils clean; even small children that won’t be handling food should be instructed to wash their hands thoroughly, both as a preventative measure in case they do touch food items and to help them learn good kitchen hygiene early. Turn Handles to the Back of the Stove – The handles of pots and pans should always be turned to the back of the stove to prevent them from being pulled from the scorching surface by small hands or from being accidentally spilled on your own part. Burns can be very serious, especially on the delicate skin of small children, so never leave handles turned in such a way that they can be grabbed by kids or jostled by your own arms and hands. Supervise Kids Closely – Children love to help out in the kitchen, and they shouldn’t be left to bask in the glow of the television while you prepare meals. Instead of exiling children to the living room and leaving them to their own devices, invite them into the kitchen but be sure to supervise them very carefully. 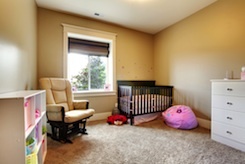 Explain Tools and Their Purposes – Tools, implements, and utensils that kids aren’t allowed to examine take on a mysterious allure, so be sure to carefully explain what each item is, what it’s used for, and how it can be dangerous. Get Kids Involved – When children are engaged in safe kitchen activities they’re less likely to be drawn to unsafe ones while you’re otherwise occupied. Let your charges complete small, safe food prep tasks as you cook; in addition to keeping them safely entertained, it also gives them a sense of accomplishment and teaches new skills. Avoid Scalds – The American Academy of Pediatrics recommends that parents turn water heater temperatures to 120° or less to avoid accidental scalds, which are the most common type of burn seen in small children that visit emergency rooms. However, some parents may have missed the memo; to be safe, assume that your employers have not adjusted their water heaters and teach kids to be very, very careful with the sink. Outlaw Running and Horseplay – Let it be known before you enter the kitchen together for the first time that horseplay, running, or roughhousing of any kind is strictly forbidden, and take a no-tolerance stance on the issue. There are too many potential hazards in the kitchen for kids to treat it like a playground. Keep Small Appliances Clear of the Sink – Small appliances that can easily drop into a sink full of water should be handled carefully, and unplugged immediately after use to prevent electrocution. No Climbing! – Kids are usually taught not to climb onto shelves or counters in order to reach items placed on high surfaces, so it’s important for you to model the same behavior. If climbing is unavoidable, be sure to use a designated step stool and do so safely, rather than clambering onto a kitchen chair or the countertop. 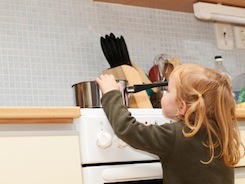 Keep Kids Clear of the Oven – Curiosity is a major motivator for kids, especially if there are tasty treats in the oven. Watching cookies go from gooey batter to delicious snacks is fascinating for little ones, who may want to peek into the oven from time to time. Be sure that they know not to ever open the oven themselves, and to stand well clear of the searing heat when you open it for them. All of the safety precautions in the world can’t take the place of strict supervision, so do your best to maintain a close watch on your charges as they spend time with you in the kitchen. Also, ensure that there is a small fire extinguisher on hand before preparing a meal in your employers’ home, just to be on the safe side.